This article is about the performance convention. For uses, see The Fourth Wall. The fourth wall is a performance convention in which an invisible, imagined wall separates actors from the audience. While the audience can see through this "wall", the convention assumes, the actors act as if they cannot. From the 16th century onwards, the rise of illusionism in staging practices, which culminated in the realism and naturalism of the theatre of the 19th century, led to the development of the fourth wall concept. The metaphor suggests a relationship to the mise-en-scène behind a proscenium arch. 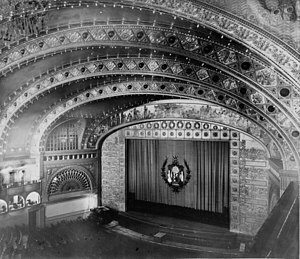 When a scene is set indoors and three of the walls of its room are presented onstage, in what is known as a box set, the "fourth" of them would run along the line (technically called the "proscenium") dividing the room from the auditorium. The "fourth wall", though, is a theatrical convention, rather than of set design. The actors ignore the audience, focus their attention exclusively on the dramatic world, and remain absorbed in its fiction, in a state that the theatre practitioner Konstantin Stanislavski called "public solitude" (the ability to behave as one would in private, despite, in actuality, being watched intently while so doing, or to be 'alone in public'). In this way, the fourth wall exists regardless of the presence of any actual walls in the set, or the physical arrangement of the theatre building or performance space, or the actors' distance from or proximity to the audience. "Breaking the fourth wall" is any instance in which this performance convention, having been adopted more generally in the drama, is violated. This can be done through either directly referencing the audience, the play as a play, or the characters' fictionality. The temporary suspension of the convention in this way draws attention to its use in the rest of the performance. This act of drawing attention to a play's performance conventions is metatheatrical. A similar effect of metareference is achieved when the performance convention of avoiding direct contact with the camera, generally used by actors in a television drama or film, is temporarily suspended. The phrase "breaking the fourth wall" is used to describe such effects in those media. Breaking the fourth wall is also possible in other media, such as video games and books. The presence of the fourth wall is an established convention of modern realistic theatre, which has led some artists to draw direct attention to it for dramatic or comic effect when a boundary is "broken", when an actor or character addresses the audience directly. Breaking the fourth wall is common in pantomime and children's theatre where, for example, a character might ask the children for help, as when Peter Pan appeals to the audience to applaud in an effort to revive the fading Tinker Bell ("If you believe in fairies, clap your hands!"). Many Shakespearian plays use this technique for comic effect. The acceptance of the transparency of the fourth wall is part of the suspension of disbelief between a work of fiction and an audience, allowing them to enjoy the fiction as though they were observing real events. 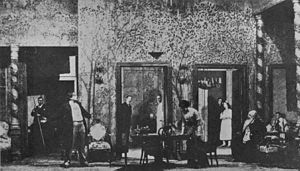 Critic Vincent Canby described it in 1987 as "that invisible scrim that forever separates the audience from the stage". Kōji Mitsui breaks the fourth wall in Kurosawa's The Lower Depths. The earliest recorded breaking of the fourth wall in serious cinema was in Mary MacLane's revolutionary 1918 silent film Men Who Have Made Love to Me, in which the enigmatic authoress - who portrays herself - interrupts the vignettes onscreen to address the audience directly. Also in 1918, in A Dog's Life, written, directed, and starring Charlie Chaplin, after finding a wallet with money in it, "The Tramp", Chaplin's most famous character, looks right at the audience with his signature eyebrow raised. Oliver Hardy was one of the first notable examples of breaking the fourth wall in his films with Stan Laurel, when he would often stare directly at the camera to seek sympathy from viewers. Groucho Marx spoke directly to the audience in Animal Crackers (1930), and Horse Feathers (1932), in the later film advising them to "go out to the lobby" during Chico Marx's piano interlude. Comedy films by Mel Brooks, Monty Python, and Zucker, Abrahams and Zucker frequently broke the fourth wall, such that with these films, "the fourth wall is so flimsy and so frequently shattered that it might as well not exist", according to The A.V. Club. In Akira Kurosawa's 1957 adaptation of Gorky's The Lower Depths, the film abruptly ends with Kōji Mitsui breaking the fourth wall to utter a callous remark about a fellow slum dweller's suicide. By having Mitsui use the startling technique, Kurosawa not only stresses his character's victorious nihilism but also suggests the film's theatrical origins. Breaking the fourth wall is an integral part of the ending of Alejandro Jodorowsky's 1973 film The Holy Mountain. In the Mel Brooks film Blazing Saddles (1974), the characters literally break the fourth wall. Woody Allen broke the fourth wall several times in his movie Annie Hall (1977), as he explained, "because I felt many of the people in the audience had the same feelings and the same problems. I wanted to talk to them directly and confront them." His 1985 film The Purple Rose of Cairo features the breaking of the fourth wall as a central plot point. The John Hughes movie Ferris Bueller's Day Off (1986), is another well-known fourth-wall-breaking movie. Bueller, played by Matthew Broderick, often turns to the camera without breaking character to tell his thought process or explain his reasoning. Another Chicago area fourth-wall-breaking film, High Fidelity, has John Cusack's character Rob intimately sharing his life struggles and confessions with the audience. Two more recent examples are the 2016 film Deadpool, in which it is used as a comic device between the main character and the audience and the 2017 film I, Tonya, where Tonya Harding and the other characters tell a first person story of Tonya's life as a black comedy. Jerry Lewis wrote in his 1971 book The Total Filmmaker, “Some film-makers believe you should never have an actor look directly into the camera. They maintain it makes the audience uneasy, and interrupts the screen story. I think that is nonsense, and usually I have my actors, in a single, look direct into the camera at least once in a film, if a point is to be served.” Martin and Lewis look directly at the audience in You’re Never Too Young (1955), and Lewis and co-star Stella Stevens each look directly into the camera several times in The Nutty Professor (1963), and Lewis’ character holds a pantomime conversation with the audience in The Disorderly Orderly (1964). The final scene of The Patsy (1964) is famous for revealing to the audience the movie as a movie, and Lewis as actor/director. On television, breaking the fourth wall has been done throughout the history of the medium. George Burns did it numerous times on The George Burns and Gracie Allen Show, where he starred in with his real-life wife Gracie Allen from 1950 to 1958. Dean Martin and Jerry Lewis routinely broke the fourth wall in their 1950 to 1955 Colgate Comedy Hour sketches. It's Garry Shandling's Show and Mrs. Brown's Boys both have their title character walking between sets mid-scene, and the latter occasionally shows characters retaking fluffed lines. Another television character who regularly breaks the fourth wall is Francis Urquhart in the British TV drama series House of Cards, To Play the King and The Final Cut. Urquhart addresses the audience several times during each episode, giving the viewer comments on his own actions on the show. The same technique is also used, though less frequently, in the American adaptation of House of Cards by main character Frank Underwood and by his wife Claire. On the 1977-1984 sitcom, Three's Company, and later on the 1979-1980 sitcom, The Ropers, the husband character Stanley Roper (played by Norman Fell) would frequently break the fourth wall in a subtle manner, by turning to look at the camera while laughing after ridiculing his wife Helen, played by Audra Lindley. A similar technique was often used in British television series Hustle, with characters winking or smiling knowingly at the camera at key points in the action. The 2001–2006 Fox sitcom The Bernie Mac Show had the lead character Bernie Mac breaking the fourth wall talking to "America". The convention of breaking the fourth wall is often seen on mockumentary sitcoms, including The Office. Mockumentary shows which break the fourth wall poke fun at the documentary genre with the intention of increasing the satiric tone of the show. Characters in The Office directly speak to the audience during interview sequences. Characters are removed from the rest of the group to speak and reflect on their experiences. When this occurs, the rules of an impersonal documentary are shattered. The person behind the camera, the interviewer, is also referenced when the characters gaze and speak straight to the camera. The interviewer, however, is only indirectly spoken to and remains hidden. This technique, when used in shows with complex genres, serves to heighten the comic tone of the show while also proving that the camera itself is far from a passive onlooker. Several Nick Jr. shows such as Blue's Clues, Team Umizoomi, and Dora the Explorer as well as a few non-Nick Jr. cartoons had characters talking to the child watching the show and encouraging them to participate in the story, some shows used a child viewer voice calling the answer while some shows didn't use a voice at all, some of their shows though, such as the shows they distribute from Nelvana Limited, don't use the fourth wall breaks. The Netflix series A Series of Unfortunate Events, based on the Daniel Handler's book series of the same name, incorporates some of the narrative elements from the books by having Lemony Snicket as a narrator character (played by Patrick Warburton) speaking directly to the television viewer that frequently breaks the fourth wall to explain various literary wordplay that was included in the books. Given their interactive nature, nearly all video games break the fourth wall by asking for the player's participation. But beyond the obvious ways in which video games break the fourth wall (e.g. by having UI elements on the screen, etc. ), there are several other ways that games have done this. These can include having the character face the direction of the player/screen, having a self-aware character that recognizes that they are in a video game, or having secret or bonus content set outside the game's narrative that can either extend the game world (such as with the use of false documents) or provide "behind the scenes" type content. But since video games are inherently much more interactive than traditional films and literature, defining what truly breaks the fourth wall in the video game medium becomes difficult. Steven Conway, writing for Gamasutra, suggests that in video games, many purported examples of breaking the fourth wall are actually better understood as relocations of the fourth wall or expansions of the "magic circle" (the fictional game world) to encompass the player. This is in contrast to traditional fourth wall breaks, which break the audience's illusion or suspension of disbelief, by acknowledging them directly. Conway argues that this expansion of the magic circle in video games actually serves to more fully immerse a player into the fictional world rather than take the viewer out of the fictional world, as is more common in traditional fourth wall breaks. An example of this expansion of the magic circle can be found in the game Evidence: The Last Ritual, in which the player receives an in-game email at their real-life email address and must visit out-of-game websites to solve some of the puzzles in the game. Other games may expand the magic circle to include the game's hardware. For example, X-Men for the Mega Drive/Genesis required players to reset their game console at a certain point to reset the X-Men's in-game Hazard Room, while Metal Gear Solid asked the player to put the DualShock controller on their neck to simulate a back massage being given in-game. Other examples include the idle animation of Sonic the Hedgehog in his games where the on-screen character would look to the player and tap his foot impatiently if left alone for a while, and one level of Max Payne has the eponymous character come to the realization they are in a video game, and narrate what the player sees as part of the UI. Eternal Darkness, which included a sanity meter, would simulate various common computer glitches to the player as the sanity meter drained, including the Blue Screen of Death. The Stanley Parable is also a well known example of this, as the narrator from the game constantly tries to reason with the player, even going so far as to beg the player to switch off the game at one point. The method of breaking the fourth wall in literature is typically referred to as metafiction. Metafiction genre occurs when a character within a literary work acknowledges the reality that they are in fact a fictitious being. The use of the fourth wall in literature can be traced back as far as The Canterbury Tales and Don Quixote. However, it was popularized in the early 20th century during the Post-Modern literary movement. Artists like Virginia Woolf in To the Lighthouse and Kurt Vonnegut in Breakfast of Champions used the genre to question the accepted knowledge and sources of the culture. The use of metafiction or breaking the fourth wall in literature varies from that on stage in that the experience is not communal but personal to the reader and develops a self-consciousness within the character/reader relationship that works to build trust and expand thought. This does not involve acknowledgment of a character’s fictive nature. Breaking the fourth wall in literature is not always metafiction. Modern examples of breaking the fourth wall include Ada Palmer’s Terra Ignota and William Goldman’s The Princess Bride. ^ a b Bell, Elizabeth S. (2008). Theories of Performance. Sage. p. 203. ISBN 978-1-4129-2637-9. ^ a b Wallis, Mick; Shepherd, Simon (1998). Studying plays. Arnold. p. 214. ISBN 0-340-73156-7. ^ Gray, Paul (1964). "Stanislavski and America: a critical chronology". Tulane Drama Review. 9 (2): 21–60. ^ Mangan, Michael (2013). The Drama, Theatre and Performance Companion. Palgrave Macmillan. p. 172. ISBN 978-1-137-01552-5. ^ Abelman, Robert (1998). Reaching a critical mass: a critical analysis of television entertainment. L. Erlbaum Associates. pp. 8–11. ISBN 0-8058-2199-6. ^ "Study Guide: The Complete Works of William Shakespeare (Abridged)" (PDF). p. 10. Retrieved August 3, 2017. When the fourth wall is kicked down, as it is in this show, we have to expect that sometimes the unexpected will occur. ^ "Mary MacLane – Women Film Pioneers Project". wfpp.cdrs.columbia.edu. ^ Blevins, Joe (1 March 2016). "This supercut breaks cinema's fabled fourth wall hundreds of times". The A.V. Club. Retrieved 19 August 2016. ^ Galbraith IV, Stuart (2002). The Emperor and the Wolf – The Lives and Films of Akira Kurosawa and Toshiro Mifune. Faber. p. 240. ISBN 0-571-19982-8. ^ Björkman, Stig (1995) . Woody Allen on Woody Allen. London: Faber and Faber. p. 77. ISBN 0-571-17335-7. ^ "The Patsy Movie Ending". dino4ever – via YouTube. ^ "The George Burns and Gracie Allen Show Cast". TVGuide.com. Retrieved 2015-04-09. ^ Dessau, Bruce (1 March 2011). "Mrs Brown's Boys: mainstream comedy for the middle-aged". The Guardian. ^ Cartmell, Deborah (2007). The Cambridge Companion to Literature on Screen. Cambridge University Press. p. 244. ISBN 0521614864. ^ Macaulay, Scott (24 April 2013). "Breaking the Fourth Wall Supercut". Filmmaker. Retrieved 5 July 2013. ^ Lawler, Kelly (13 January 2017). "How Netflix's 'Series of Unfortunate Events' outshines the 2004 film". USA Today. Retrieved 13 January 2017. ^ a b c d Conway, Steven (22 July 2009). "A Circular Wall? Reformulating the Fourth Wall for Video Games". Gamasutra. Retrieved 23 January 2017. ^ a b Conway, Steven (22 July 2009). "A Circular Wall? Reformulating the Fourth Wall for Video Games". Gamasutra. Retrieved 23 January 2017. ^ Waugh, Patricia (1984). Metafiction – The Theory and Practice of Self-Conscious Fiction. Routledge. ^ "Metafiction as Genre Fiction". ^ Turner, Cathy (2015). Dramaturgy and Architecture. Palgrave Macmillan UK. ^ "A dialog on narrative voice complicity and intimacy". ^ "Meta-irony Narrative Frames and the Princess Bride".